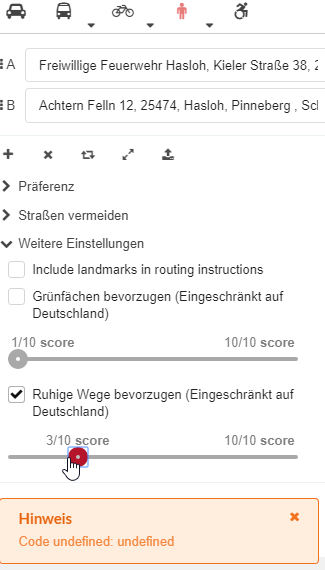 I’m using the profile “hiking” for palling bike routes, because I want to use “Grünfächen bevorzugen (Eingeschränkt auf Deutschland)” and “Ruhige Wege bevorzugen (Eingeschränkt auf Deutschland)”. But it isn’t working anymore. See attachment. I’ve just put in a fix for this and so it should be up and running when we get the pedestrian routing graphs rebuilt (hopefully within the next 2 weeks).